Sammid Led Light Will be your Choose! LED string light, it's made with a fine bendable copper wire that can conform to any shape you want. This item is a 10m long string of copper wire lights with 100 LEDs. All the LED are waterproof and eco-friendly. They are recharged by using a separate solar panel, which requires exposure to sunlight during the day. 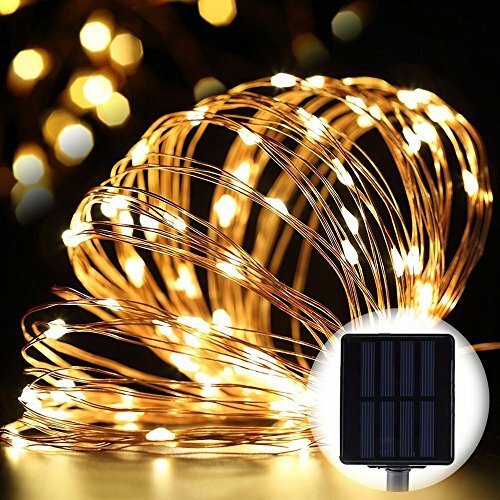 Perfect for positioning lights to any decorative or holiday project, suitable for party, square, garden, indoor decoration, outdoor decoration, etc. This item is a 10m long string of copper wire lights with 100 LEDs. 2 modes available: Flash and steady on. (There mode and power button on the back of solar panel). Made of high quality copper wire, flexible, IP65 waterproof, durable for daily use,Low heat generating, energy-saving and environmentally friendly, safe to use. Solar powered, built-in light sensor, charged at day time and automatically turn on at night. You can string these lights through tree branches, drape them over fences or hang in gazebos. They are sure to be the focal point in any scene.